Kirsten Easthope is a pop surrealist artist who paints pin-up art inspired by vintage artists and pulp imagery. She paints her pin-ups on everything from crucifixes to old bowling pins, adding an extra kitschy element. The original painting that we own, which is titled "Trailerpark Queen," is arguably her most famous piece, appearing on everything from t-shirts and stickers to lunch boxes. What I love about this piece is the fact that it was obviously inspired by pulp imagery and as an obsessive vintage paperback collector, I love it. We have so many trailer themed pulp paperbacks that one day I will even do a post about them. They were a very kitschy genre that make a lot of people giggle today, and they also often appear on lunchboxes, magnets, and stickers. What Easthope has done is taken that pulp paperback imagery and exaggerated it just a tad for a nice effect. I love the Peggy Bundy/John Waters take on the hair and the outfit plus the adorable tacky pillow she sits on. 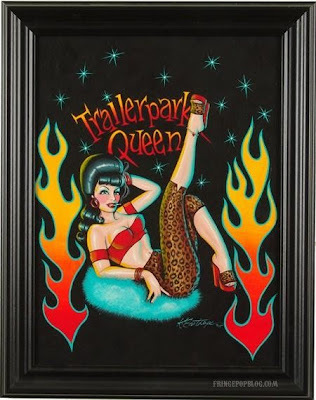 A "trailerpark queen" indeed!